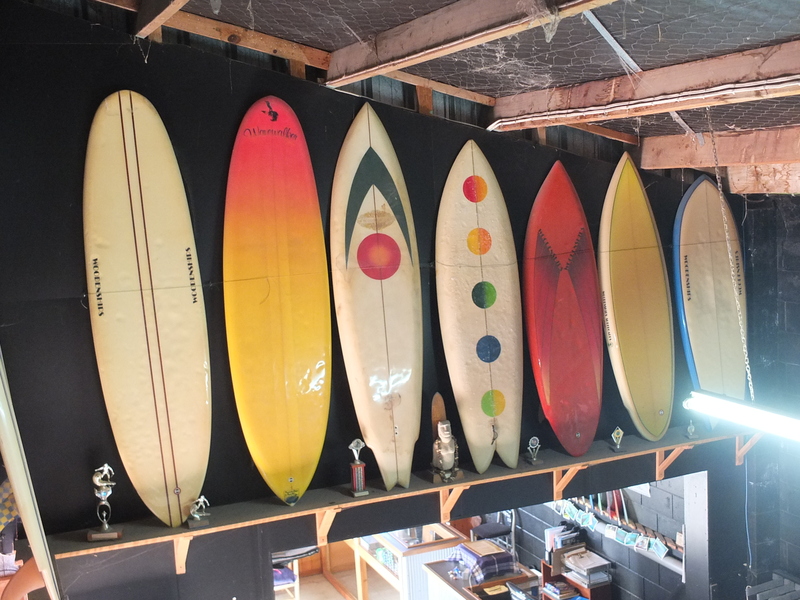 We built the factory in ’83 and of course it’s full of memories like this line up of boards we made way back when, there are a couple of Twin Keel Fish from the 1970’s (the one with the dots was Rogers). The Wing Swallow Single Fin with the green arrow head is from the same time period and was shaped for Alan who was part of the original “Bream Bay Bubble” crew. The rest of the boards are early 1980’s and there is an interesting mix of Single, Twins and Thruster and Four fins! Also of note is an evolutionary tale of fin templates as we used our beloved Twin Keel fins on boards that came after the Fish days and you can see transition stages of our templates changing reluctantly towards the main stream(shudder!). 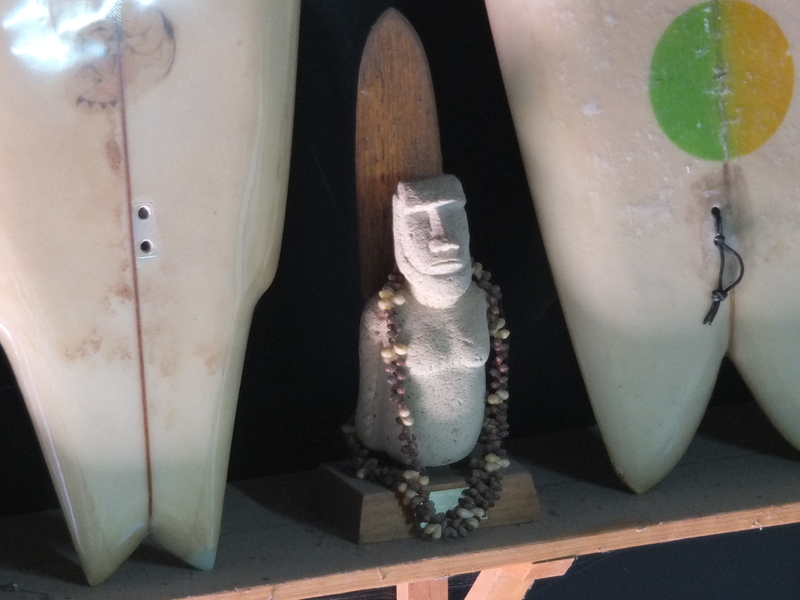 There is a bunch of 7’0″ mini longboards which were among the first ones in the new era as evidenced by the added foam strips and double stringers used to widen out shortboard blanks to accomodate the shape(no longboard blanks in existence in N.Z back then). 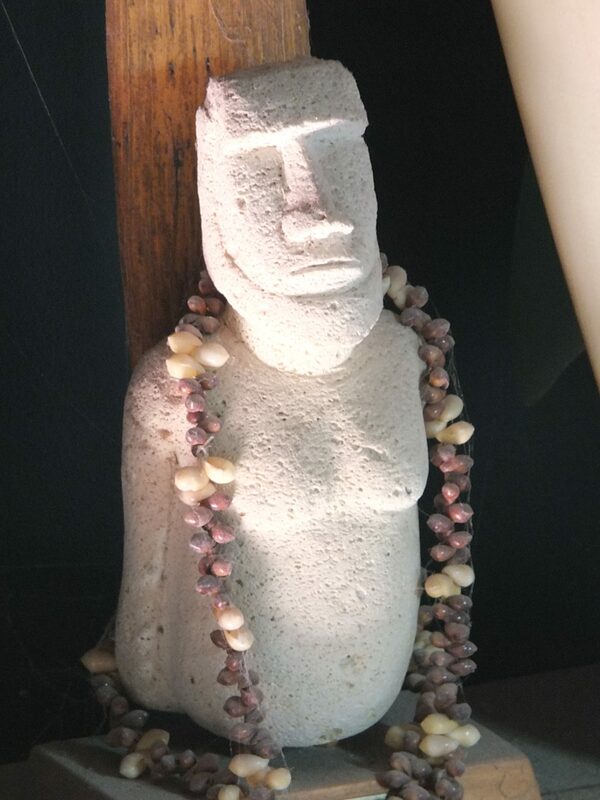 The Rapa Nui Moai style trophy is from one of Roger’s Longboard Tour wins and is a favourite having been hand made by one of Gisborne’s surfing characters from locally gathered materials, ah! a trip down memory lane . . . I remember flattening out the sand to lay the concrete floor!! That was hands on Tony! Thanks for all the hard work both building the factory and working on it over the years! Surfed that twin keel with the circles a few months ago . Still goes awsome. That was a fun surf Tony, looking forward to the next time we do that! Cheers, Roger. Surfed that twin keel with the circles on it a few months ago. It still goes awsome .